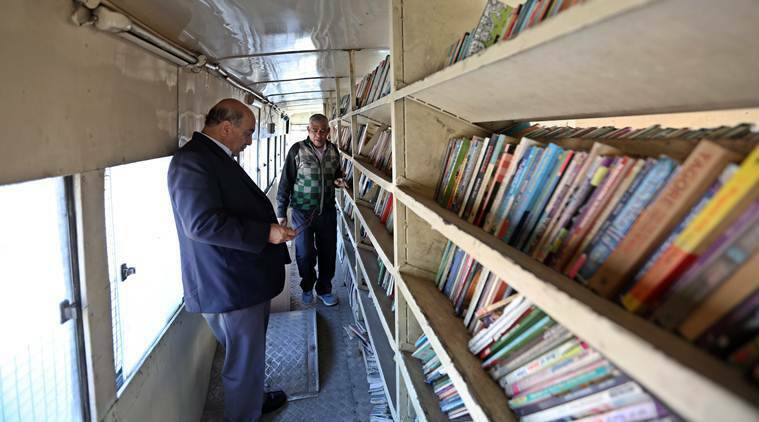 One of them, Yogender Sharma (56), has been a librarian with one of DPL’s five mobile library buses — which take books to a hundred fixed points across the city every week — for over a year now. At 2.00 pm on Saturday afternoon, a green and yellow bus left the Delhi Public Library (DPL) headquarter and crawled through the chaotic Chandni Chowk traffic. The driver was extra cautious — sharp swerves could knock down books lined up in shelves inside the bus. By 2.35 pm, the bus had reached its destination in Mayur Vihar Phase II, and three men alighted to get to work, unfolding a table and three chairs to set up a makeshift library for the next hour and a half. At 2 pm every day, he travels with the books to different parts of Delhi, and returns to the DPL headquarter at 8 pm. On Sundays, he works in the morning and takes the library to Azadpur, which he says is the highlight of his week and work. “It’s pure joy. At least a hundred people visit the library every time we go there. Children begin to line up in anticipation even before we reach and we have to ask them to move so we can park the bus. It’s a resettlement area — the children and even adults there do not have access to other sources of books,” he said. The job, he said, makes him happy because “users give us a lot of regard”.“On Fridays, I go to Rohini Sector 15 — another area where we get a lot of visitors and members. One of our members there is a lecturer in Delhi University, whose two children borrow books from our library every week. He also visits from time to time and says his journey to becoming a teacher began with him borrowing and reading books from these moving libraries. He sends tea for us with his children sometimes,” he said. At Mayur Vihar, though, footfall was relatively less. Sharma and his assistant Vinod Kumar (49) both said that visits to upmarket areas always tend to be languid. “We have gone door to door to distribute forms and gather users, but the fact is that people here already have access to reading resources,” said Kumar. For Brijmohan (30), the most difficult part of his job is parking. As the bus reached its next point at Mayur Vihar Extension, he found cars parked at the library’s fixed point. “Thoda aage peeche karke I manage to find enough space,” he said.